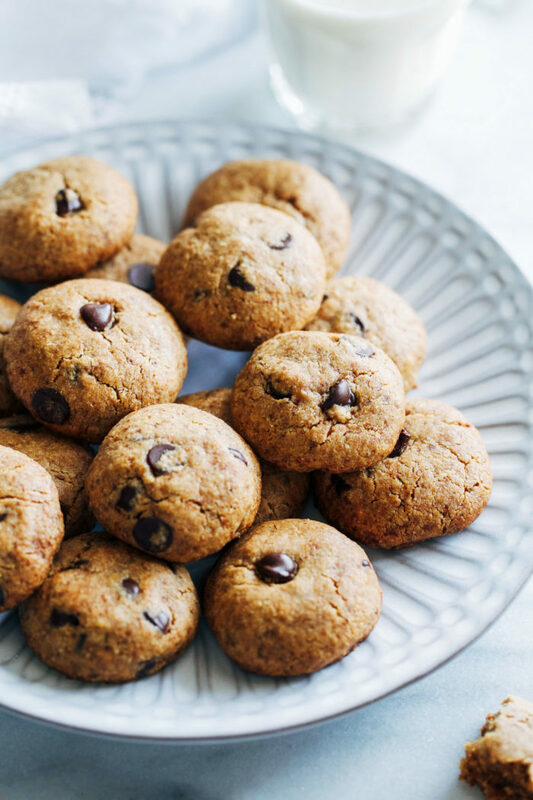 Vegan and Gluten-free Peanut Butter Cookies- a super easy and wholesome recipe for peanut butter cookies that are nutritious enough for breakfast yet delicious enough for dessert. It was only a matter of time before this happened. Once I landed the recipe for The Best Vegan and Gluten-free Chocolate Chip Cookies, a peanut butter version was inevitable. Because I love me some peanut butter and I know you do too. The only thing I was on the fence about was whether or not to add chocolate chips. Not because I think they should be left out but I was concerned about your feeling on this matter. To solve this dilemma, I reached out on Instagram and was pleasantly surprised to see the vast majority agreed chocolate is a must. Of course there were a few that said no chocolate and one that even said no peanut butter. Well that kind of defeats the purpose of a peanut butter cookie recipe, silly face! 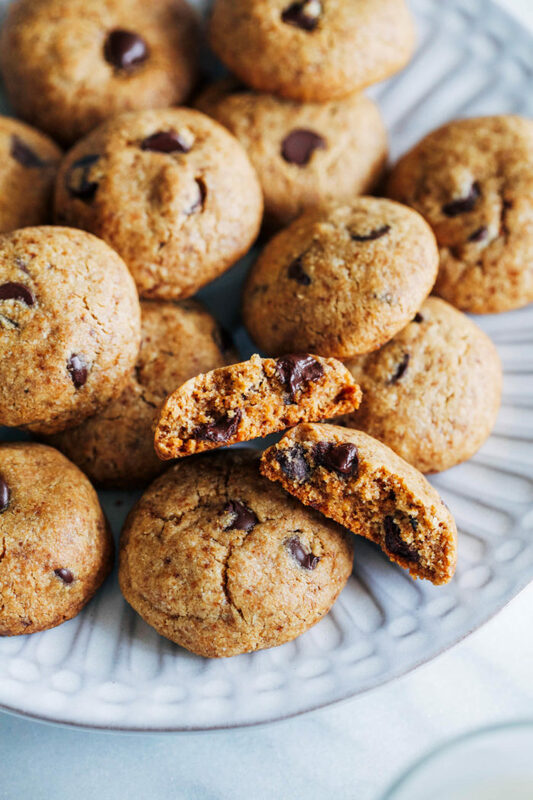 Like I said before, I used the base from my go-to chocolate chip cookies to test this peanut butter version by replacing some of the coconut oil with…peanut butter. But they didn’t spread as well as I’d like them too and I’m fairly confident that had to do with the fact that my peanut butter doesn’t have added oils. So then I tried again, using the same ratio of coconut oil and just adding peanut butter for flavor, and voila! They spread into beautiful little round discs. 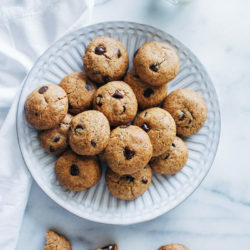 What that means is that these cookies are higher in fat than my other versions so if you’re looking for a low-fat cookie recipe, this isn’t it. Sorry, just being honest. 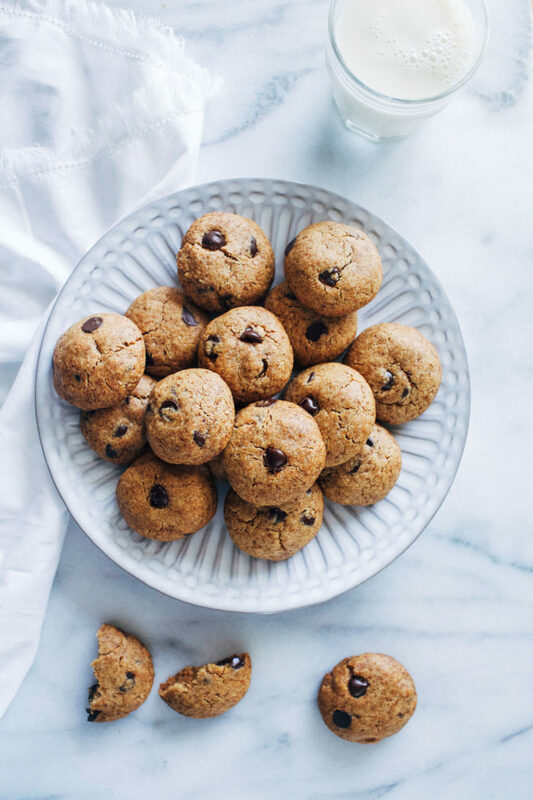 It is, however, a nutritious option as the oat and almond flour offer fiber, protein, and minerals that standard all-purpose does not. That’s always my first concern when it comes to food…how much nutrition am I getting per calorie? In the bowl of a stand mixer with a paddle attachment (or a large bowl using a hand mixer) combine coconut oil and coconut sugar. Mix on high for 1 minute then add peanut butter and vanilla extract. Continue to mix for another 30 seconds. With the mixer running add the almond flour first. Next add the oat flour, baking soda, baking powder, and salt. Continue to mix for about 20 seconds, until a dough forms. Using a spatula, scrape down the sides and bottom of the bowl in between mixing to assure all of the ingredients are combined. Add two tablespoons almond milk and allow to mix for 15 seconds. If the dough appears dry and crumbly, try allowing it to mix for longer. If it’s still crumbly, try adding a tablespoon of milk. Stir in the chocolate chips at the end with a spatula. 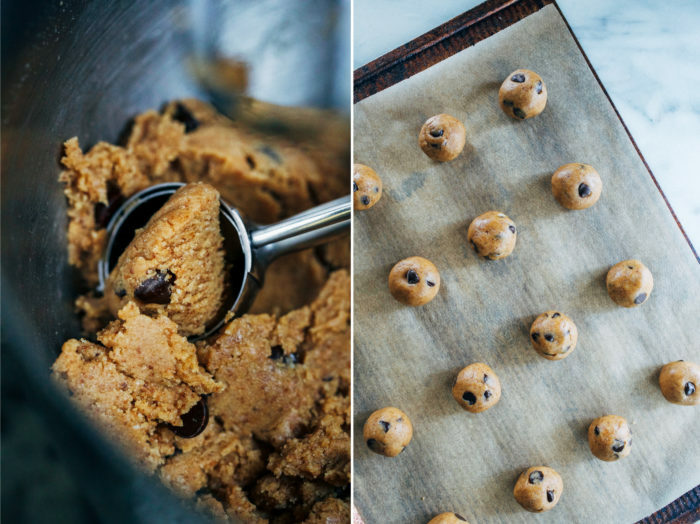 Using a scooper or a spoon, scoop out about 1 and 1/2 tablespoons of dough at a time. Arrange them on the baking sheet with about 2 inches in between each. Gently press each dough ball down. Bake in the oven for 12-13 minutes, until edges are light golden brown. Allow to cool for at least 15 minutes before serving. They will continue to firm up as they cool. Leftovers can be stored in an airtight container for up to 5 days. You can also freeze the balls before baking and bake from frozen when ready to eat. **Make sure you are using a natural peanut butter without added oil. If your peanut butter has oil in it then you may need to reduce the amount of coconut oil. If it has salt then you don’t need to add as much salt. 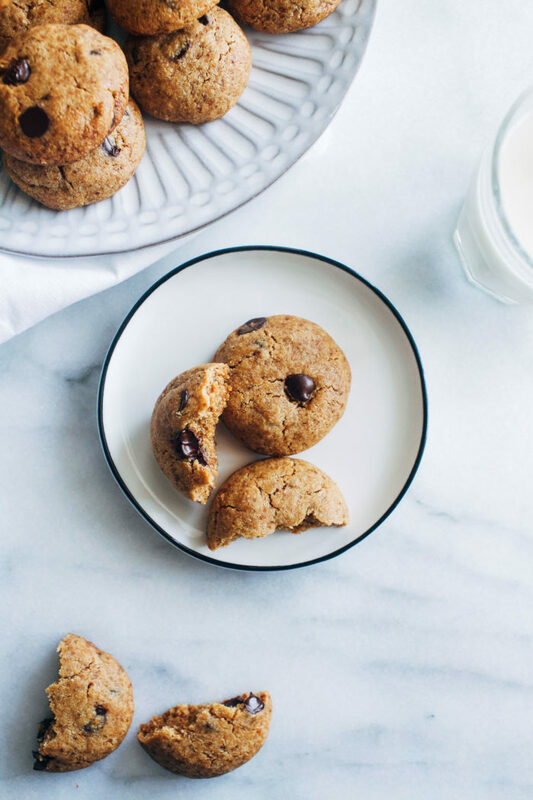 ***Be sure to use certified gluten-free oat flour for allergies.